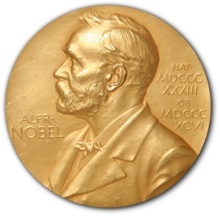 The family of Francis Crick are to sell his Nobel Prize Medal and diploma, won for his work on the structure of DNA. An opening bid of $500,000 has been set. What got my attention they are also considering to sell a letter Crick wrote to his then 12 year-old son explaining the DNA structure model work is also for sale. ** Perhaps copies of this letter are already available? Crick later wrote some popular science books, e.g. What Mad Pursuit (1988, a memoir) and The Astonishing Hypothesis: The Scientific Search for the Soul (1995). There is also a collection of lectures about his work, Of Molecules and Men (2004). Somewhat more controversial is Life Itself: It’s Origin and Nature (1988). Crick‘s Nobel prize medal fetched $US 2.27 million to … “Jack Wang, the CEO of a Chinese company that claims medically regenerative powers for the electromagnetic devices it intends to sell”.